We have a wide selection of coloured branded fidget spinners ready to be customised with your logo. 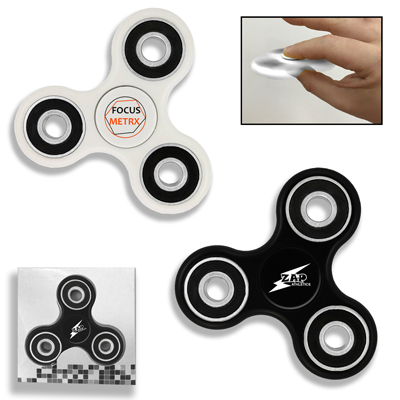 We can create a package of branded fidget spinners for you, making your purchase even more cost effective. The latest craze and Image Worx Promotional Merchandise has them! These Fidget Spinners can reduce stress & anxiety, improve focus, and alleviate boredom! Modelled after the popular Fidget Spinner and moulded from ABS plastic these spinners are quickly trending as the number one must have gadget on the market. Spinners are small, discrete and durable making them easy to carry with you anywhere you go. Each Fidget Spinner is packed inside a form fitting plastic tray and individually boxed with a “ready for retail” look. Prices includes your logo printed 1 colour x 1 position.